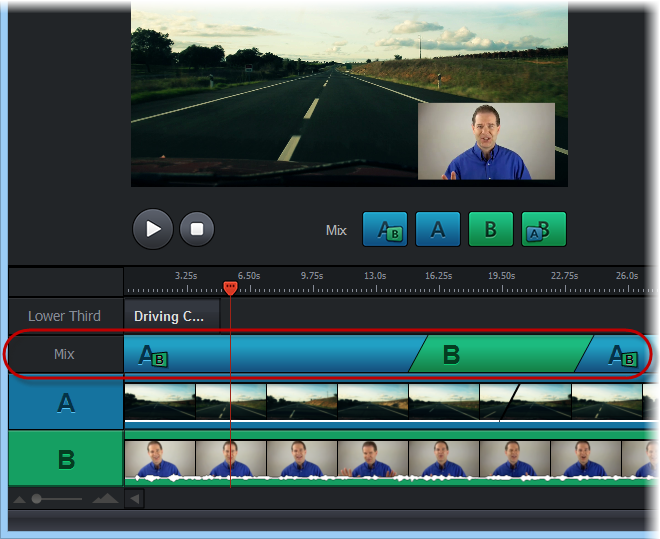 Articulate Replay lets you mix videos to control how clips on both tracks interact with one another. Flip smoothly between tracks, or show both tracks at once with a picture-in-picture mode. It's your choice. Click the timeline at the point where you want to add a video mix. The playhead (red vertical line) will move to that point on the timeline. Click any of the four mix buttons below the video stage. A+B: This is a picture-in-picture mix that fills the stage with content from track A and also displays content from track B in the corner of the stage. A: Mix A fills the stage with content from track A. Content in track B won't be displayed (though audio from track B will still be heard). B: Mix B fills the stage with content from track B. Content in track A won't be displayed (though audio from track A will still be heard). B+A: This is a picture-in-picture mix that fills the stage with content from track B and also displays content from track A in the corner of the stage. 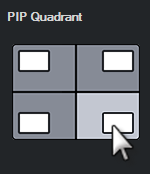 If you chose one of the picture-in-picture mixes in the previous step, select a Picture-in-Picture Quadrant in the panel on the right side of the screen for the smaller of the two videos. Tip: You can add as many video mixes as you like to flip back-and-forth between tracks or switch to a picture-in-picture mode. Need to change an existing video mix? No problem. Right-click the mix you want to change, and select one of the other mixes. Click the timeline where the video mix that you want to change starts. The playhead (red vertical line) will move to that point on the timeline. Click the button for the video mix you want to use. To change the timing of a video mix, simply drag it left or right along the timeline. Dashed vertical lines will appear when objects are aligned to help you with exact placement. 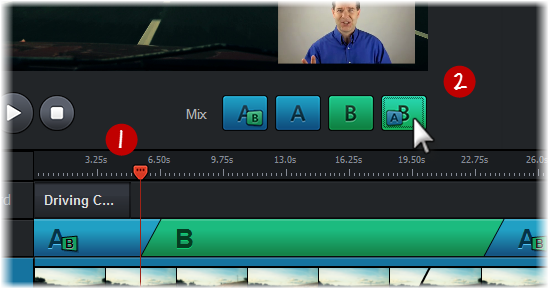 To change the duration of a video mix, drag its left or right edge on the timeline. Dashed vertical lines will appear when objects are aligned to help you with exact placement. To remove a video mix, just select it on the timeline, then press the Delete key on your keyboard.